There’s no denying the health benefits of incorporating more plant-based proteins into the daily diet. 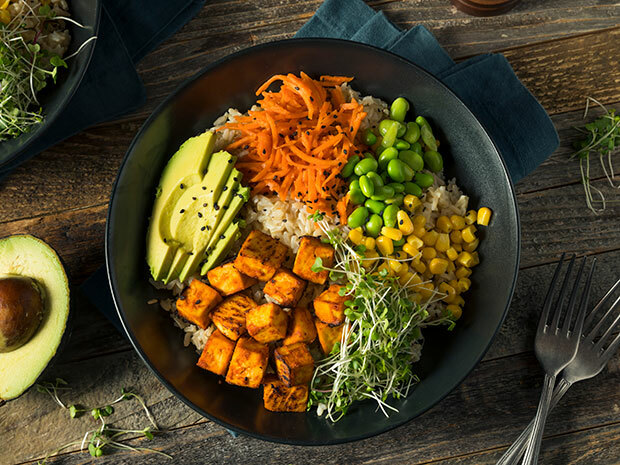 In foodservice, menuing these plant-based options is a must for vegetarians and vegans, but it’s not always the most appealing option for mainstream consumers. However, when the menu description focuses on flavor first, plant-based proteins become less about health and more about taste—and sales follow suit. Vegetarians were once outliers, and meat-and-potatoes dinner were a way of life. These days, though, plant-based eating is not only more common than it used to be, but it’s also trendy. Fifty-nine percent of consumers eat a plant-based protein once a week, according to Technomic’s 2017 Center of the Plate: Seafood & Vegetarian report. And while much of that starts at home, it still matters in foodservice. It’s particularly important in the college & university and healthcare segments, where 16% and 20% of consumers, respectively, want more plant-based options on the menu, according to IFMA and Datassential, 2017/2018. For operators, it’s a matter of finding the right plant-based options, and conveniently, the face of vegetarian food is rapidly changing and expanding. From crumbles to strips to formable options, operators can now experiment with unlimited plant-based protein menu options. But when it comes to consumer interest in plant-based proteins, what might be surprising is the allure. According to Food Business News, 52% of U.S. adults said that they choose plant-based protein for taste, compared to just 39% who said that they choose them for health purposes—so operators should focus on creating craveable options, not just healthful ones. When more than half of customers are clamoring for tasty plant-based proteins, there are opportunities for operators. Considering ramping up menu options – here are a few ways to do that. Experiment with flavor and variety. Plant-based proteins lend themselves well to ethnic flavors, which are a hot trend in the foodservice world. Mexican-inspired flavors are particularly popular, according to Datassential MenuTrends, with current favorites including salsa, guacamole, crema, citrus and jalapenos. Emphasize snacks and apps. Consumers of all ages love snacks, and they can be such an easy sell. Menu snackable favorites, such as quesadillas, poppers or flatbreads, but create them with veggie proteins instead. Share the brand information. Brand loyalty can be a big help for sales. Forty percent of consumers say that brand names are important when they buy plant-based products, according to Food Business News. For instance, MorningStar Farms is the No. 1 leader in plant-based protein, outselling the nearest branded competitor 8 to 1, according to NPD Supply Track Latest 12 Months, December 2017. By offering these well-known and loved products, more consumers may want to partake in eating more plant-based foods. Keeping the menu fresh is key to creating craveable options. Offer something delicious, then switch it up and leave customers wanting more to help entice future visits.